So just how accurate is Apple Watch's heart rate sensor? Can you trust the Apple Watch heart rate sensor? Well, it’s pretty darn accurate it seems, going by some testing performed by a Wisconsin-based engineer who's into Mac and iPhone development. That would be Brad Larson, who tested the Apple Watch on a run alongside the Mio Alpha. Slashgear spotted Larson’s experiment and the resulting graph on Twitter (see above), with the engineer tweeting: "Extracted the raw Apple Watch HealthKit heartrate samples after a run and compared it to an HR monitor I had on". 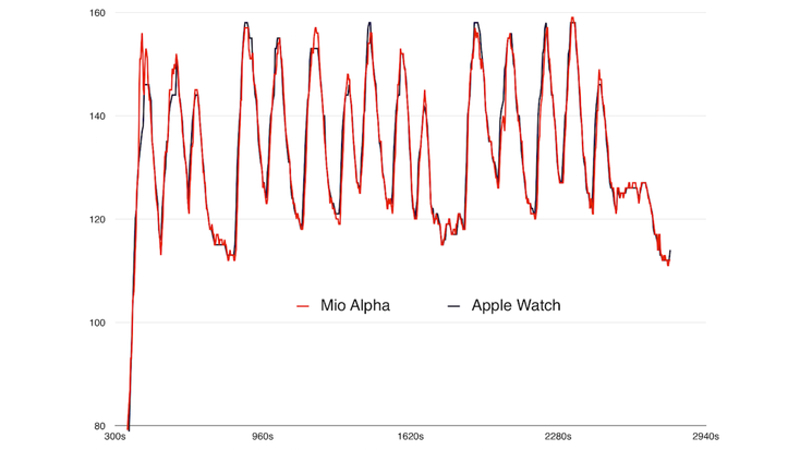 As you can see, Apple’s smartwatch is very close to the Mio device -- though initially it slightly underestimates a few peaks, and then overshoots a couple later, but this really is only a very slight overall difference we’re talking about. The big deal here is that as Slashgear notes, the Mio Alpha is highly respected for its accuracy in terms of heart rate readings -- indeed it has a 99 percent EKG accuracy as measured by San Francisco State University, which concluded: "Mio’s optical heart rate technology provides an extremely valid and accurate measurement of heart rate during cycling, walking, jogging and running as compared to electrocardiography". However, one commenter on Larson’s Twitter post, Troy Angrignon, didn’t agree with all this: "My own 40+ tests show 0-20 percent data loss on Apple; 0-40 percent loss on Mio vs. std EKG. This just compares two equally poor options". Angrignon really doesn’t seem keen on the Apple Watch, though, and in another tweet bashed it as a battery demolisher when using workout apps: "#AppleWatch is a #batterykiller. 9:30am. Did 3.5 hours of workouts. Watch is at 69 percent. iPhone is at *20 percent* battery 5 hours into my day. Lame". While a 3.5 hour session is a lot more than your average person will do, that’s still a worrying sounding statistic. Have our Apple Watch owning readers found anything like the same issues? Of course, the heart rate sensor has come under fire in tattoogate, the obligatory fracas (there’s one with every Apple device) whereby those with dark ink wrist tattoos have found they interfere with the sensor, doing things like constantly pausing the workout app and pretty much rendering it useless. Apple has admitted the tattoo issue, but its suggestion to instead use a Bluetooth chest strap (or other external heart rate monitor) wirelessly hooked up to the smartwatch didn’t go down particularly well.